Simple Lord Vishnu Puja - How To Perform Vishnu Puja At home? A simple Vishnu Puja at home can be performed by lighting diya, doing aarti, offering Tulsi leaves and chanting of the mantra Om Namo Narayanaya Namah or Vishnu Sahasranama. Select a calm and quite place preferably north east corner of the house . Place a photograph or idol or picture of Vishnu on a yellow color cloth. Keep a ghee lamp ready with one wick. Yellow fruits (banana) or yellow color sweets ready in a plate. Before starting puja pray to Ganesha in mind. Meditate for a few minutes to clear the mind of unwanted thoughts and to attain concentration. How To Perform Vishnu Puja At home? Now light the lamp with one wick using pure cow ghee. Meditate or pray to Srihari Vishnu. Offer flowers – Tulsi leaves. You can light incense or agarbathis (optional). 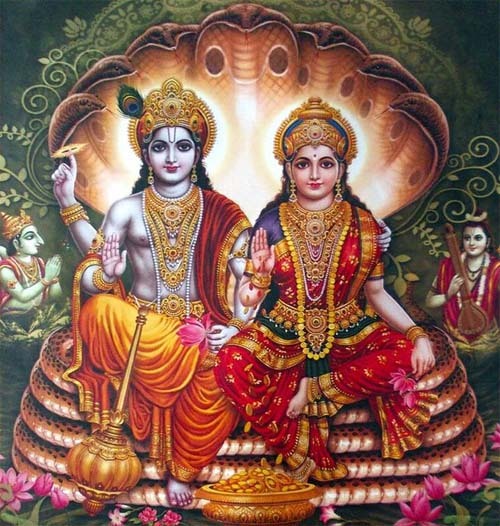 Chant the prayer – Om Namo Narayanaya Namah. You can meditate for a few minutes or read some shlokas or prayers dedicated to Vishnu like Vishnu Sahasranama, Vishnu Suktam, Purusha Suktam, Narayana Upanishad etc. After the Puja remove the fruits and share it as ‘prasad’ with others. After the puja, find some time to read the Srimad Bhagavad Purana.